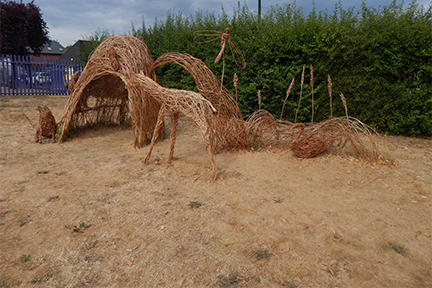 This project involves children from St Peter's C of E School and includes the following elements:- enable the children to work outdoors, to use, create with, understand and appreciate the materials found in our natural environment. To value where we live, not just in monetary terms but as a key to our own happiness and as an asset with intrinsic value all of its own, that as custodians we should be looking after. 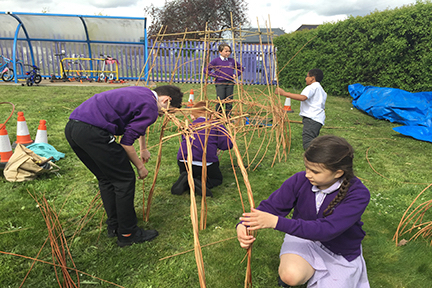 The children will learn about the history, cultivation of willow and the willow industry in the UK and the many uses willow weaving can be used for. 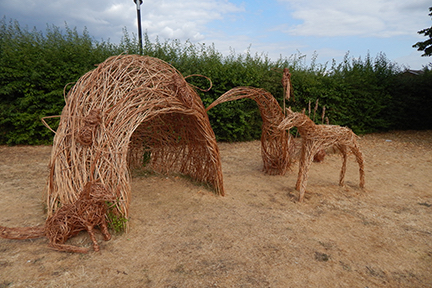 Willow is an annual, highly sustainable crop grown in the Somerset Levels and has been a traditional building and craft material used in this country for centuries. This technique has proved one popular with schools as it is a great team building project bringing the whole school together. To begin with the groups will visit Burnham Beeches, which is local to their school, is a National Nature Reserve and European Special Area of Conservation as well as being a SSSI site. They will make observational drawings of the plants, trees, animals and insects that use the woodland and heathland such dragonflies, bees, wood, ants, deer, barn owls and tree creepers, from which they will then create small models from wire. Using these we will collaboratively make designs for the final willow sculptures. 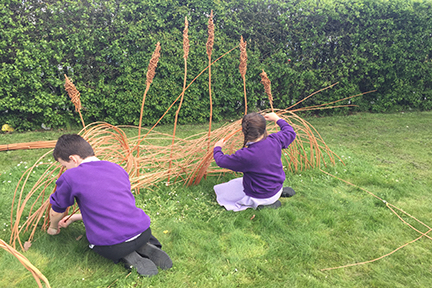 Using armatures made from pea canes and wrapping with willow to create form and movement form they will produce sculptures for the school grounds. The sculptures often evolve and change form as they are being built encouraging children to experiment, be adaptable to new ideas and problem solving as well as learning new skills. Willow structures can create a play space with summer shade or an outdoor classroom and gathering space. 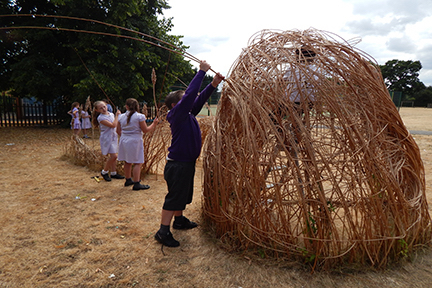 This project would enable the children to work with willow for the first time and offer them the opportunity to create installation sculptures for their school grounds to enhance their surroundings, be proud of and a reminder of what they have learnt and achieved. It will be viewed by many visitors, their parents and passers by to the school on a daily basis.